This article is about the trader and explorer. For other uses, see Marco Polo (disambiguation). Marco Polo (/ˈmɑːrkoʊ ˈpoʊloʊ/ ( listen), Venetian: [ˈmaɾko ˈpolo], Italian: [ˈmarko ˈpɔːlo]; 1254 – January 8–9, 1324) was an Venetian merchant, explorer, and writer, born in the Republic of Venice. 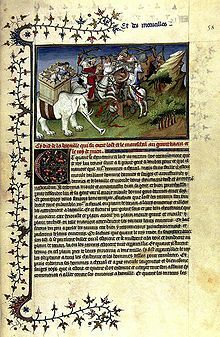 His travels are recorded in Livre des merveilles du monde (Book of the Marvels of the World, also known as The Travels of Marco Polo, c. 1300), a book that described to Europeans the wealth and great size of China, its capital Peking, and other Asian cities and countries. Marco learned the mercantile trade from his father and his uncle, Niccolò and Maffeo, who travelled through Asia and met Kublai Khan. In 1269, they returned to Venice to meet Marco for the first time. The three of them embarked on an epic journey to Asia, returning after 24 years to find Venice at war with Genoa; Marco was imprisoned and dictated his stories to a cellmate. He was released in 1299, became a wealthy merchant, married, and had three children. He died in 1324 and was buried in the church of San Lorenzo in Venice. Though he was not the first European to reach China (see Europeans in Medieval China), Marco Polo was the first to leave a detailed chronicle of his experience. This book inspired Christopher Columbus and many other travellers. There is a substantial literature based on Polo's writings; he also influenced European cartography, leading to the introduction of the Fra Mauro map. Marco Polo was born in 1254[nb 1] in the Republic of Venice, though the exact date and place of birth are archivally unknown. 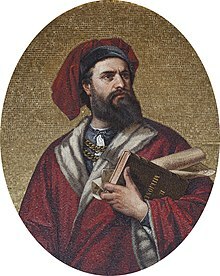 Marco Polo's birthplace is generally considered to be Venice, but some also claimed Constantinople and the island of Korčula as his birth place. There is dispute as to whether the Polo family is of Venetian origin, as Venetian historical sources considered them to be of Dalmatian origin. The lack of evidence makes the Korčula theory (probably under Ramusio influence) as a specific birthplace strongly disputed, and even some Croatian scholars consider it merely invented. His father, Niccolò Polo, a merchant, traded with the Near East, becoming wealthy and achieving great prestige. Niccolò and his brother Maffeo set off on a trading voyage before Marco's birth. In 1260, Niccolò and Maffeo, while residing in Constantinople, then the capital of the Latin Empire, foresaw a political change; they liquidated their assets into jewels and moved away. According to The Travels of Marco Polo, they passed through much of Asia, and met with Kublai Khan, a Mongol ruler and founder of the Yuan dynasty. Their decision to leave Constantinople proved timely. In 1261 Michael VIII Palaiologos, the ruler of the Empire of Nicaea, took Constantinople, promptly burned the Venetian quarter and re-established the Eastern Roman Empire. Captured Venetian citizens were blinded, while many of those who managed to escape perished aboard overloaded refugee ships fleeing to other Venetian colonies in the Aegean Sea. In 1269, Niccolò and Maffeo returned to their families in Venice, meeting young Marco for the first time. In 1271, during the rule of Doge Lorenzo Tiepolo, Marco Polo (at seventeen years of age), his father, and his uncle set off for Asia on the series of adventures that Marco later documented in his book. They returned to Venice in 1295, 24 years later, with many riches and treasures. They had travelled almost 15,000 miles (24,000 km). 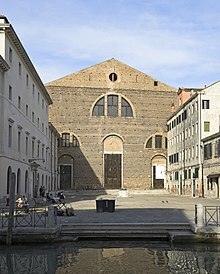 Polo was finally released from captivity in August 1299, and returned home to Venice, where his father and uncle in the meantime had purchased a large palazzo in the zone named contrada San Giovanni Crisostomo (Corte del Milion). For such a venture, the Polo family probably invested profits from trading, and even many gemstones they brought from the East. The company continued its activities and Marco soon became a wealthy merchant. Marco and his uncle Maffeo financed other expeditions, but likely never left Venetian provinces, nor returned to the Silk Road and Asia. Sometime before 1300, his father Niccolò died. In 1300, he married Donata Badoèr, the daughter of Vitale Badoèr, a merchant. They had three daughters, Fantina (married Marco Bragadin), Bellela (married Bertuccio Querini), and Moreta. In 1323, Polo was confined to bed, due to illness. On January 8, 1324, despite physicians' efforts to treat him, Polo was on his deathbed. To write and certify the will, his family requested Giovanni Giustiniani, a priest of San Procolo. His wife, Donata, and his three daughters were appointed by him as co-executrices. The church was entitled by law to a portion of his estate; he approved of this and ordered that a further sum be paid to the convent of San Lorenzo, the place where he wished to be buried. He also set free Peter, a Tartar servant, who may have accompanied him from Asia, and to whom Polo bequeathed 100 lire of Venetian denari. He divided up the rest of his assets, including several properties, among individuals, religious institutions, and every guild and fraternity to which he belonged. He also wrote off multiple debts including 300 lire that his sister-in-law owed him, and others for the convent of San Giovanni, San Paolo of the Order of Preachers, and a cleric named Friar Benvenuto. He ordered 220 soldi be paid to Giovanni Giustiniani for his work as a notary and his prayers. The will was not signed by Polo, but was validated by the then-relevant "signum manus" rule, by which the testator only had to touch the document to make it legally valid. Due to the Venetian law stating that the day ends at sunset, the exact date of Marco Polo's death cannot be determined, but according to some scholars it was between the sunsets of January 8 and 9, 1324. Biblioteca Marciana, which holds the original copy of his testament, dates the testament in January 9, 1323, and gives the date of his death at some time in June 1324. 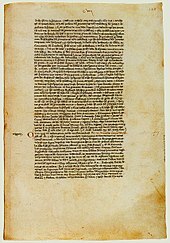 An authoritative version of Marco Polo's book does not and cannot exist, for the early manuscripts differ significantly. The published editions of his book either rely on single manuscripts, blend multiple versions together, or add notes to clarify, for example in the English translation by Henry Yule. The 1938 English translation by A.C. Moule and Paul Pelliot is based on a Latin manuscript found in the library of the Cathedral of Toledo in 1932, and is 50% longer than other versions. 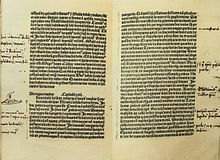 Approximately 150 manuscript copies in various languages are known to exist, and before availability of the printing press, discrepancies were inevitably introduced during copying and translation. The popular translation published by Penguin Books in 1958 by R.E. Latham works several texts together to make a readable whole. In 1271, Niccolò, Maffeo and Marco Polo embarked on their voyage to fulfil Kublai's request. They sailed to Acre, and then rode on camels to the Persian port of Hormuz. The Polos wanted to sail straight into China, but the ships there were not seaworthy, so they continued overland through the Silk Road, until reaching Kublai's summer palace in Shangdu, near present-day Zhangjiakou. In one instance during their trip, the Polos joined a caravan of travelling merchants whom they crossed paths with. Unfortunately, the party was soon attacked by bandits, who used the cover of a sandstorm to ambush them. The Polos managed to fight and escape through a nearby town, but many members of the caravan were killed or enslaved. Three and a half years after leaving Venice, when Marco was about 21 years old, the Polos were welcomed by Kublai into his palace. The exact date of their arrival is unknown, but scholars estimate it to be between 1271 and 1275. [nb 2] On reaching the Yuan court, the Polos presented the sacred oil from Jerusalem and the papal letters to their patron. Marco knew four languages, and the family had accumulated a great deal of knowledge and experience that was useful to Kublai. It is possible that he became a government official; he wrote about many imperial visits to China's southern and eastern provinces, the far south and Burma. They were highly respected and sought after in the Mongolian court, and so Kublai Khan decided to decline the Polos' requests to leave China. They became worried about returning home safely, believing that if Kublai died, his enemies might turn against them because of their close involvement with the ruler. In 1292, Kublai's great-nephew, then ruler of Persia, sent representatives to China in search of a potential wife, and they asked the Polos to accompany them, so they were permitted to return to Persia with the wedding party—which left that same year from Zaitun in southern China on a fleet of 14 junks. The party sailed to the port of Singapore, travelled north to Sumatra, and sailed west to the Point Pedro port of Jaffna under Savakanmaindan and to Pandyan of Tamilakkam. Eventually Polo crossed the Arabian Sea to Hormuz. The two-year voyage was a perilous one—of the six hundred people (not including the crew) in the convoy only eighteen had survived (including all three Polos). The Polos left the wedding party after reaching Hormuz and travelled overland to the port of Trebizond on the Black Sea, the present day Trabzon. The British scholar Ronald Latham has pointed out that The Book of Marvels was in fact a collaboration written in 1298–1299 between Polo and a professional writer of romances, Rustichello of Pisa. Latham also argued that Rustichello may have glamorised Polo's accounts, and added fantastic and romantic elements that made the book a bestseller. The Italian scholar Luigi Foscolo Benedetto had previously demonstrated that the book was written in the same "leisurely, conversational style" that characterised Rustichello's other works, and that some passages in the book were taken verbatim or with minimal modifications from other writings by Rustichello. For example, the opening introduction in The Book of Marvels to "emperors and kings, dukes and marquises" was lifted straight out of an Arthurian romance Rustichello had written several years earlier, and the account of the second meeting between Polo and Kublai Khan at the latter's court is almost the same as that of the arrival of Tristan at the court of King Arthur at Camelot in that same book. Latham believed that many elements of the book, such as legends of the Middle East and mentions of exotic marvels, may have been the work of Rustichello who was giving what medieval European readers expected to find in a travel book. Since its publication, some have viewed the book with skepticism. Some in the Middle Ages regarded the book simply as a romance or fable, due largely to the sharp difference of its descriptions of a sophisticated civilisation in China to other early accounts by Giovanni da Pian del Carpine and William of Rubruck, who portrayed the Mongols as 'barbarians' who appeared to belong to 'some other world'. Doubts have also been raised in later centuries about Marco Polo's narrative of his travels in China, for example for his failure to mention the Great Wall of China, and in particular the difficulties in identifying many of the place names he used (the great majority, however, have since been identified). Many have questioned if he had visited the places he mentioned in his itinerary, if he had appropriated the accounts of his father and uncle or other travelers, and some doubted if he even reached China, or that if he did, perhaps never went beyond Khanbaliq (Beijing). 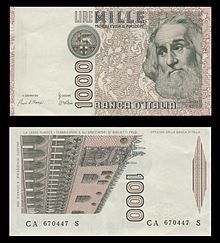 Modern studies have further shown that details given in Marco Polo's book, such as the currencies used, salt productions and revenues, are accurate and unique. Such detailed descriptions are not found in other non-Chinese sources, and their accuracy is supported by archaeological evidence as well as Chinese records compiled after Polo had left China. His accounts are therefore unlikely to have been obtained second hand. Other accounts have also been verified; for example, when visiting Zhenjiang in Jiangsu, China, Marco Polo noted that a large number of Christian churches had been built there. His claim is confirmed by a Chinese text of the 14th century explaining how a Sogdian named Mar-Sargis from Samarkand founded six Nestorian Christian churches there in addition to one in Hangzhou during the second half of the 13th century. His story of the princess Kököchin sent from China to Persia to marry the Īl-khān is also confirmed by independent sources in both Persia and China. Supporters of the book's basic accuracy countered on the points raised by skeptics such as footbinding and the Great Wall of China. Historian Stephen G. Haw argued that the Great Walls were built to keep out northern invaders, whereas the ruling dynasty during Marco Polo's visit were those very northern invaders. They note that the Great Wall familiar to us today is a Ming structure built some two centuries after Marco Polo's travels; and that the Mongol rulers whom Polo served controlled territories both north and south of today's wall, and would have no reasons to maintain any fortifications that may have remained there from the earlier dynasties. Other Europeans who travelled to Khanbaliq during the Yuan dynasty, such as Giovanni de' Marignolli and Odoric of Pordenone, said nothing about the wall either. The Muslim traveler Ibn Battuta, who asked about the wall when he visited China during the Yuan dynasty, could find no one who had either seen it or knew of anyone who had seen it, suggesting that while ruins of the wall constructed in the earlier periods might have existed, they were not significant or noteworthy at that time. Haw also argued that footbinding was not common even among Chinese during Polo's time and almost unknown among the Mongols. While the Italian missionary Odoric of Pordenone who visited Yuan China mentioned footbinding (it is however unclear whether he was merely relaying something he had heard as his description is inaccurate), no other foreign visitors to Yuan China mentioned the practice, perhaps an indication that the footbinding was not widespread or was not practiced in an extreme form at that time. Marco Polo himself noted (in the Toledo manuscript) the dainty walk of Chinese women who took very short steps. It has also been noted by other scholars that many of the things not mentioned by Marco Polo such as tea and chopsticks were not mentioned by other travelers as well. Haw also pointed out that despite the few omissions, Marco Polo's account is more extensive, more accurate and more detailed than those of other foreign travelers to China in this period. Marco Polo even observed Chinese nautical inventions such as the watertight compartments of bulkhead partitions in Chinese ships, knowledge of which he was keen to share with his fellow Venetians. Stephen G. Haw, however, challenges this idea that Polo exaggerated his own importance, writing that, "contrary to what has often been said ... Marco does not claim any very exalted position for himself in the Yuan empire." He points out that Marco never claimed to be a minister of high rank, a darughachi, a leader of a tumen (i.e. 10,000 men), not even the leader of 1,000 men, only that he was an emissary for the khan and held a position of some honor. Haw sees this as a reasonable claim if Marco was a keshig, who numbered some fourteen thousand at the time. Haw explains how the earliest manuscripts of Polo's accounts provide contradicting information about his role in Yangzhou, with some stating he was just a simple resident, others stating he was a governor, and Ramusio's manuscript claiming he was simply holding that office as a temporary substitute for someone else, yet all the manuscripts concur that he worked as an esteemed emissary for the khan. Haw also objected to the approach to finding mention of Marco Polo in Chinese texts, contending that contemporaneous Europeans had little regard for using surnames, and a direct Chinese transcription of the name "Marco" ignores the possibility of him taking on a Chinese or even Mongol name that had no bearing or similarity with his Latin name. A number of errors in Marco Polo's account have been noted: for example, he described the bridge later known as Marco Polo Bridge as having twenty-four arches instead of eleven or thirteen. He also said that city wall of Khanbaliq had twelve gates when it had only eleven. Archaeologists have also pointed out that Polo may have mixed up the details from the two attempted invasions of Japan by Kublai Khan in 1274 and 1281. Polo wrote of five-masted ships, when archaeological excavations found that the ships in fact had only three masts. Wood accused Marco Polo of taking other people's accounts in his book, retelling other stories as his own, or basing his accounts on Persian guidebooks or other lost sources. For example, Sinologist Francis Woodman Cleaves noted that Polo's account of the voyage of the princess Kököchin from China to Persia to marry the Īl-khān in 1293 has been confirmed by a passage in the 15th-century Chinese work Yongle Encyclopedia and by the Persian historian Rashid-al-Din Hamadani in his work Jami' al-tawarikh. However neither of these accounts mentions Polo or indeed any European as part of the bridal party, and Wood used the lack of mention of Polo in these works as an example of Polo's "retelling of a well-known tale". Morgan, in Polo's defence, noted that even the princess herself was not mentioned in the Chinese source, and that it would have been surprising if Polo had been mentioned by Rashid-al-Din. Historian Igor de Rachewiltz argued that Marco Polo's account in fact allows the Persian and Chinese sources to be reconciled – by relaying the information that two of the three envoys sent (mentioned in the Chinese source and whose names accord with those given by Polo) had died during the voyage, it explains why only the third who survived, Coja/Khoja, was mentioned by Rashìd al-Dìn. Polo had therefore completed the story by providing information not found in either source. He also noted that the only Persian source that mentions the princess was not completed until 1310–11, therefore Marco Polo could not have learned the information from any Persian book. According to de Rachewiltz, the concordance of Polo's detailed account of the princess with other independent sources that gave only incomplete information is proof of the veracity of Polo's story and his presence in China. In 2012, the University of Tübingen Sinologist and historian Hans Ulrich Vogel released a detailed analysis of Polo's description of currencies, salt production and revenues, and argued that the evidence supports his presence in China because he included details which he could not have otherwise known. Vogel noted that no other Western, Arab, or Persian sources have given such accurate and unique details about the currencies of China, for example, the shape and size of the paper, the use of seals, the various denominations of paper money as well as variations in currency usage in different regions of China, such as the use of cowry shells in Yunnan, details supported by archaeological evidence and Chinese sources compiled long after Polo's had left China. His accounts of salt production and revenues from the salt monopoly are also accurate, and accord with Chinese documents of the Yuan era. Economic historian Mark Elvin, in his preface to Vogel's 2013 monograph, concludes that Vogel "demonstrates by specific example after specific example the ultimately overwhelming probability of the broad authenticity" of Polo's account. Many problems were caused by the oral transmission of the original text and the proliferation of significantly different hand-copied manuscripts. For instance, did Polo exert "political authority" (seignora) in Yangzhou or merely "sojourn" (sejourna) there. Elvin concludes that "those who doubted, although mistaken, were not always being casual or foolish", but "the case as a whole had now been closed": the book is, "in essence, authentic, and, when used with care, in broad terms to be trusted as a serious though obviously not always final, witness." 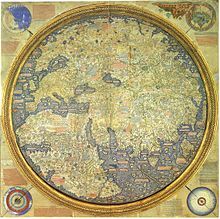 That fine illuminated world map on parchment, which can still be seen in a large cabinet alongside the choir of their monastery [the Camaldolese monastery of San Michele di Murano] was by one of the brothers of the monastery, who took great delight in the study of cosmography, diligently drawn and copied from a most beautiful and very old nautical map and a world map that had been brought from Cathay by the most honourable Messer Marco Polo and his father. Though Marco Polo never produced a map that illustrated his journey, his family drew several maps to the Far East based on the wayward's accounts. These collection of maps were signed by Polo's three daughters: Fantina, Bellela and Moreta. Not only did it contain maps of his journey, but also sea routes to Japan, Siberia's Kamchatka Peninsula, the Bering Strait and even to the coastlines of Alaska, centuries before the rediscovery of the Americas by Europeans. Marco Polo's 1292 voyage from China is used as a backdrop for the plot of Uncharted 2: Among Thieves (2009), where Nathan Drake (the protagonist) searches for the Cintamani Stone, which was from the fabled city of Shambhala. A board game 'The Voyages of Marco Polo' plays over a map of Eurasia, with multiple routes to 'recreate' Polo's journey. Avram Davidson's novel (written with Grania Davis) Marco Polo and the Sleeping Beauty (1988), a serio-comic fantasy with Polo as the protagonist. Marco Polo (2014 - 2016) was a Netflix television drama series about Marco Polo's early years in the court of Kublai Khan created by John Fusco. ^ Many sources state "around 1254"; Britannica 2002, p. 571 states, "born in or around 1254". Some historians mentioned that he was born on September 15, 1254, but that date is not supported by primary sources, nor is it endorsed by mainstream scholarship. ^ Yule & Cordier 1923, ch.18 states, "Then there are sheep here as big as asses; and their tails are so large and fat, that one tail shall weigh some 30 lb. They are fine fat beasts, and afford capital mutton." ^ Bergreen 2007, pp. 340–42. ^ Benedetto, Luigi Foscolo (1965). "Marco Polo, Il Milione". Istituto Geografico DeAgostini (in Italian). ^ "Marco Polo – Exploration". History.com. Retrieved January 9, 2017. ^ "BBC – History – Historic Figures: Marco Polo (c. 1254–1324)". Retrieved January 9, 2017. ^ a b Puljiz-Šostik 2015, p. 5. ^ Puljiz-Šostik 2015, pp. 5–6: have not yet been determined where (nor exactly when) the Traveler was born. His birth was not recorded in the Venetian registers of births (and not only that: the first document that connects Venice and his family is the same testament of his uncle Marco made yr. 1280), and Korčula's registers of births began to take a lot after his birth (only from 1583 yr.). Yet the Italian historiography considers that he was born in Venice and calls for the alleged Marco's paternal grandfather – Andrea Polo of San Felice (whose, as we said, first mention is by G.B. Ramusio), while our historical science claims the place of his birth island Korčula. Italian historians often, due to lack of archives of the birth of Marco Polo in Venice, stress that certainly was born in the Venetian Republic since Dalmatia was then in its composition. ^ Puljiz-Šostik 2015, p. 14. ^ Bergreen 2007, p. 24. ^ Puljiz-Šostik 2015, pp. 5–16. ^ Puljiz-Šostik 2015, p. 8. ^ a b Bergreen 2007, p. 25. ^ a b Rugoff, Milton (2015). Marco Polo. New Word City. ISBN 978-1-61230-838-8. ^ Noule&Pelliot 1938, pp. 15–16. ^ a b c d e Pavešković, Anđelko (1998). "Putopisac Marko Polo" [Travel writer Marco Polo]. Godišnjak Poljičkog Dekanata "Poljica" (23): 38–66. ^ a b Bergreen 2007, p. 36. ^ Puljiz-Šostik 2015, p. 24. ^ Bergreen 2007, p. 37. ^ Yule, The Travels of Marco Polo, London, 1870: reprinted by Dover, New York, 1983. ^ Puljiz-Šostik 2015, pp. 28–36. ^ Polo, Marco; Latham, Ronald (translator) (1958). The Travels of Marco Polo, p. 16. New York: Penguin Books. ISBN 0-14-044057-7. ^ Puljiz-Šostik 2015, pp. 8, 12, 28–36. ^ a b Bergreen 2007, p. 332. ^ a b Bergreen 2007, p. 333. ^ Bergreen 2007, pp. 332–33. ^ Bergreen 2007, p. 333, 338. ^ Bergreen 2007, p. 339. ^ a b c d e Bergreen 2007, p. 340. ^ a b Bergreen 2007, p. 341. ^ Bergreen 2007, pp. 340–41. ^ Bergreen 2007, p. 342. 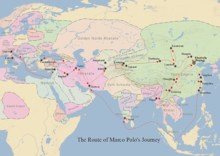 ^ The Travels of Marco Polo. (Harmondsworth, Middlesex; New York: Penguin Books, Penguin Classics, 1958; rpr. 1982 etc.) ISBN 0-14-044057-7. ^ ^ Marco Polo, Il Milione, Adelphi 2001, ISBN 88-459-1032-6, Prefazione di Bertolucci Pizzorusso Valeria, pp. x–xxi. ^ ^ Larner John, Marco Polo and the discovery of the world, Yale University Press, 1999, ISBN 0-300-07971-0 pp. 68–87. ^ a b Latham, Ronald "Introduction" pp. 7–20 from The Travels of Marco Polo, London: Folio Society, 1958 p. 11. ^ Latham, Ronald "Introduction" pp. 7–20 from The Travels of Marco Polo, London: Folio Society, 1958 pp. 11–12. ^ a b Latham, Ronald "Introduction" pp. 7–20 from The Travels of Marco Polo, London: Folio Society, 1958 p. 12. ^ a b Na Chang. "Marco Polo Was in China: New Evidence from Currencies, Salts and Revenues". Reviews in History. ^ a b c Haw, Stephen G. (2006). Marco Polo's China: A Venetian in the Realm of Khubilai Khan. Routledge. p. 1. ISBN 978-1-134-27542-7. ^ Haw, Stephen G. (2006). Marco Polo's China: A Venetian in the Realm of Khubilai Khan. Routledge. pp. 83–123. ISBN 978-1-134-27542-7. ^ a b Haeger, John W. (1978). "Marco Polo in China? Problems with Internal Evidence". 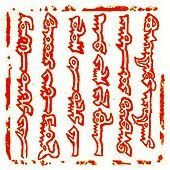 Bulletin of Sung and Yüan Studies. 14: 22–30. JSTOR 23497510. ^ Haw, Stephen G. (2006). Marco Polo's China: A Venetian in the Realm of Khubilai Khan. Routledge. pp. 66–67. ISBN 978-1-134-27542-7. ^ a b Hans Ulrich Vogel (2012). Marco Polo Was in China: New Evidence from Currencies, Salts and Revenues. Brill. ISBN 978-90-04-23193-1. ^ Emmerick, R.E. (2003) "Iranian Settlement East of the Pamirs", in Ehsan Yarshater, The Cambridge History of Iran, Vol III: The Seleucid, Parthian, and Sasanian Periods, Cambridge: Cambridge University Press, p. 275. ^ a b Francis Woodman Cleaves (1976). "A Chinese Source Bearing on Marco Polo's Departure from China and a Persian Source on his Arrival in Persia". Harvard Journal of Asiatic Studies. 36: 181–203. JSTOR 2718743. ^ Frances Wood, Did Marco Polo Go to China? (London: Secker & Warburg; Boulder, Colorado: Westview, 1995). ^ a b c Franke, Herbert (1966). "Sino-Western Contacts Under the Mongol Empire". Journal of the Hong Kong Branch of the Royal Asiatic Society. 6: 49–72. JSTOR 23881433. ^ a b Morgan, D.O. "Marco Polo in China—Or Not" 221–225 from The Journal of the Royal Asiatic Society, Volume 6, Issue # 2 July 1996 p. 222. ^ Ebrey, Patricia (2003). Women and the Family in Chinese History. Routledge. p. 196. ISBN 978-1-134-44293-5. ^ Haw, Stephen G. (2006). Marco Polo's China: A Venetian in the Realm of Khubilai Khan. Routledge. pp. 55–56. ISBN 978-1-134-27542-7. ^ a b c Igor de Rachewiltz. "F. Wood's Did Marco Polo Go To China? A Critical Appraisal by I. de Rachewiltz". ^ Haw, Stephen G. Marco Polo's China: A Venetian in the Realm of Khubilai Khan. Routledge. pp. 65–66. ISBN 978-1-134-27542-7. ^ Cotterell, Arthur. Western Power in Asia: Its Slow Rise and Swift Fall, 1415–1999. John Wiley & Sons. p. 9. ISBN 978-0-470-82489-4. ^ a b c d Morgan, D.O. "Marco Polo in China—Or Not" 221–225 from The Journal of the Royal Asiatic Society, Volume 6, Issue # 2 July 1996 p. 223. ^ a b c Stephen G. Haw (2006), Marco Polo's China: a Venetian in the Realm of Kublai Khan, London & New York: Routledge, p. 173, ISBN 0-415-34850-1. ^ Stephen G. Haw (2006), Marco Polo's China: a Venetian in the Realm of Kublai Khan, London & New York: Routledge, pp. 3–4, ISBN 0-415-34850-1. ^ Stephen G. Haw (2006), Marco Polo's China: a Venetian in the Realm of Kublai Khan, London & New York: Routledge, p. 73, ISBN 0-415-34850-1. ^ "Explorer Marco Polo 'never actually went to China". The Daily Telegraph. August 9, 2011. ^ Morgan, D.O. (July 1996). "Marco Polo in China—Or Not" 221–225". The Journal of the Royal Asiatic Society. 6 (2): 224. JSTOR 25183182. ^ Morgan, D.O. "Marco Polo in China—Or Not" 221–225 from The Journal of the Royal Asiatic Society, Volume 6, Issue # 2 July 1996 pages 225. ^ Stephen G. Haw (2006), Marco Polo's China: a Venetian in the Realm of Kublai Khan, London & New York: Routledge, pp. 1–2, ISBN 0-415-34850-1. ^ Stephen G. Haw (2006), Marco Polo's China: a Venetian in the Realm of Kublai Khan, London & New York: Routledge, pp. 2–3, ISBN 0-415-34850-1. ^ "Marco Polo was not a swindler – he really did go to China". University of Tübingen. Alpha Galileo. April 16, 2012. Archived from the original on May 3, 2012. Retrieved May 3, 2012. ^ "Marco Polo Did Go to China, New Research Shows (and the History of Paper)". The New Observer. July 31, 2013. ^ "Marco Polo was not a swindler: He really did go to China". Science Daily. ^ Hans Ulrich Vogel (2012). Marco Polo Was in China: New Evidence from Currencies, Salts and Revenues. Brill. p. xix. ISBN 978-90-04-23193-1. ^ Klein, Christopher (September 30, 2014). "Did Marco Polo Visit Alaska?". History. ^ Bittarello, Maria Beatrice (2009). "Marco Polo". In Rodney P. Carlisle (ed.). Encyclopedia of Play in Today's Society. SAGE. ISBN 978-1-4129-6670-2. ^ Jeffrey, Phillip; Mike Blackstock; Matthias Finke; Anthony Tang; Rodger Lea; Meghan Deutscher; Kento Miyaoku. "Chasing the Fugitive on Campus: Designing a Location-based Game for Collaborative Play". Proceedings of CGSA 2006 Symposium. ^ "Civilization Revolution: Great People". CivFanatics. Archived from the original on March 17, 2011. Retrieved September 4, 2009. ^ "Uncharted 2: Among Thieves". Archived from the original on September 6, 2011. ^ Donn-Byrne, Brian Oswald (1921). Messer Marco Polo. ^ "Marco Polo". IMDb TV miniseries. 1982. ^ "Marco Polo". IMDb TV miniseries. 2007. ^ "In the footsteps of Marco Polo (PBS)". WLIW.org. 2009. ^ "Netflix's 'Marco Polo' Sets December Premiere Date". Deadline Hollywood. August 28, 2014. Retrieved August 28, 2014. ^ Goldberg, Lesley (December 12, 2016). "'Marco Polo' Canceled at Netflix After Two Seasons". The Hollywood Reporter. Retrieved December 13, 2016. Marco Polo, Marci Poli Veneti de Regionibus Orientalibus, Simon Grynaeus Johannes Huttichius, Novus Orbis Regionum ac Insularum Veteribus Incognitarum, Basel, 1532, pp. 350–418. Herbermann, Charles, ed. (1913). "Marco Polo" . Catholic Encyclopedia. New York: Robert Appleton Company. Moule, Arthur Christopher; Pelliot, Paul (1938). Marco Polo: The Description of the World. 1. London: George Routledge & Sons Limited. Marco Polo (1918). Marsden, William (ed.). The Travels of Marco Polo. London: J.M. Dent & Sons. p. 461. Hart, H. Henry (1948). Marco Polo, Venetian Adventurer. Kessinger Publishing. Dalrymple, William (1989). In Xanadu. Daftary, Farhad (1994). The Assassin legends: myths of the Ismaʻilis (2 ed.). I.B. Tauris. p. 213. ISBN 978-1-85043-705-5. Otfinoski, Steven (2003). Marco Polo: to China and back. New York: Benchmark Books. ISBN 978-0-7614-1480-3.